Adam and I met at his cousin’s wedding. Our parents had been friends for close to 30 years before we met, so we always knew each other’s parents and we had a few memories of each other as children. We were both born in Montreal, but his family moved to Miami when he was very young. I grew up with one of his closest cousins and I came to Miami when she got married. Adam was at the bar when someone else was talking to me. When he realized I was uncomfortable, he smiled with the sweetest little boy grin, put his arm around my shoulder and asked if I wanted to take a shot with his friends at the bar. After a night full of laughing and dancing, he gave me a kiss goodnight and since then we never stopped talking, laughing, and dancing. We were in Montreal one weekend with all our families and friends. It was Mid-November so the whole city was covered in white snow and there were beautiful twinkling lights on the trees. It is my favourite time of year. He asked me to go on a date to our favourite sushi restaurant on one of the most beautifully lit streets. After dinner, in the middle of the street with the twinkling lights, the beautiful snow, and his sweet smile he got down on one knee and proposed. I was so shocked and so beyond happy I cried and said YES. Once we got home he had planned for all of our families and friends to greet us and celebrate. I had always loved Galia Lahav’s wedding dresses. The materials and designs are always so unique and the women who wore them always looked so beautiful, powerful, and majestic. My sister sent me a picture of a model in the Georgia gown and I immediately fell in love. She then made an appointment for me at White, a bridal store in Montreal during the Galia Lahav trunk show in the hopes that we would find this gown. At first, we didn’t see it, so I tried on a few dresses from many designers and while they were beautiful, they didn’t feel right. My sisters went searching for more gowns and found the Georgia! We were all in awe. I tried it on and immediately felt so beautiful, confident and special. I knew this was the one. It was a statement piece that felt so magical and perfect. When I came out to show them, my mom and sisters smiled and began to tear up. I then Facetimed my mother- and sister-in-law, and they smiled and started to cry too. Finally, I brought my father to see it the next day, and he got emotional too. 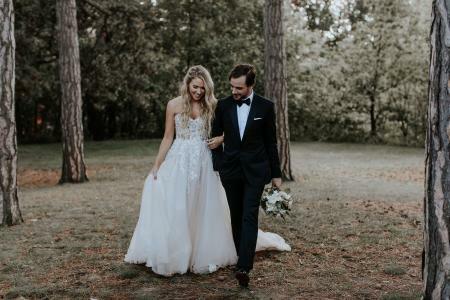 That is when I decided the Georgia Gown would become part of my fairy tale. Our wedding was in our hometown of Montreal in one of the oldest synagogues in the city. My grandparents had been going there since my mother was young and I had so many wonderful memories there as a child. The Chapel has the most beautiful antique architecture with high ceilings, antique wood, and stained glass windows. Adam and I loved the idea of getting married in a synagogue. It had all the elements that were important to us and it just felt right. Our theme was a night in Lake Como. 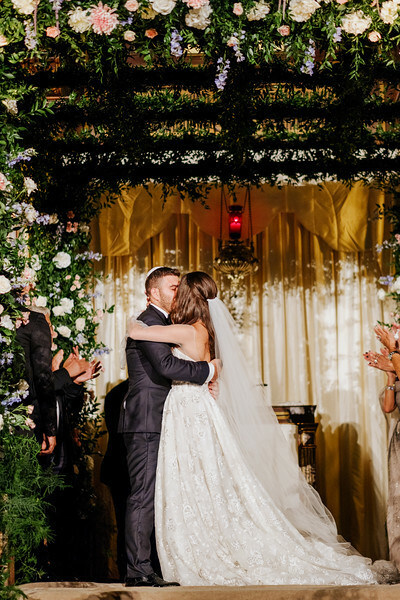 My husband and I love to travel, so for the night we wanted guests to feel like they were being transported to a magical place and to us, there is nowhere more romantic than Italy. We are so lucky to have had the most incredible team come together to help us. Our families are so creative, loving and so special, they helped me every step of the way. 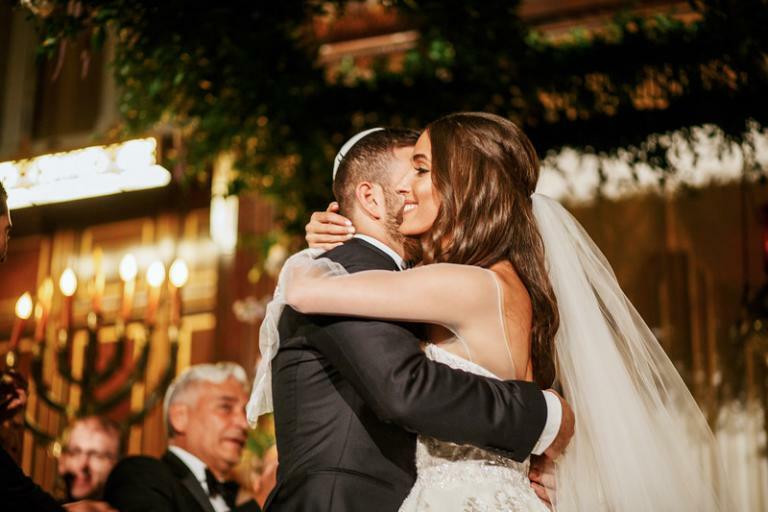 Melissa Gianna Renda was the most incredible wedding planner; she gave me inspiration and helped all of our ideas and moving parts come together to realize a night beyond anything I could have dreamed of. The walls were covered with majestic views of Lake Como. 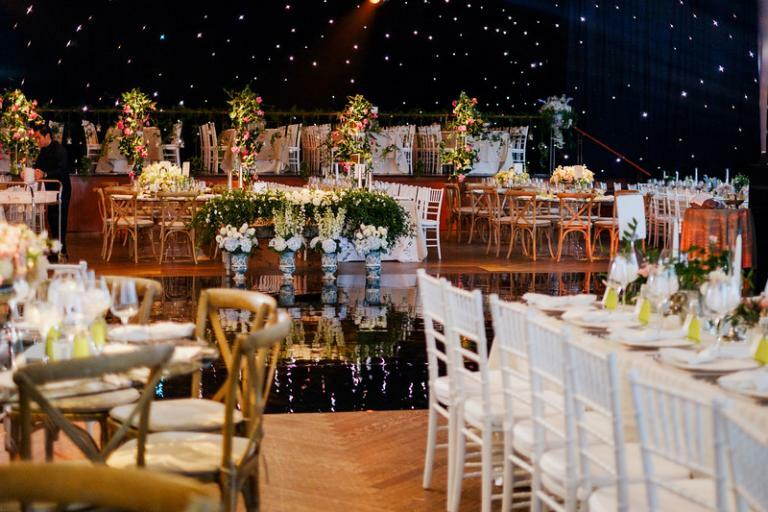 The tables and bar were adorned with breath-taking ensembles of pastel-colored flowers and the Italian inspired food and drinks were delicious. The whole vibe was romantically enchanting; we feel so lucky to have been surrounded by so much love to celebrate in a dream setting. There were so many special moments that I will always hold dear to my heart. The entire day was perfect; I smiled from start to finish. One of the moments that stood out was when I saw my husband for the first time on our wedding day. We decided not to speak or see each other for a few days before the wedding. When he came to pick me up at my parents’ home I was so nervous and excited to see him. Our families waited with him at the bottom of the stairs as I walked towards him. When he turned around and saw me, it felt like the first time he saw me again. He stared up at me with his charming boy-like grin, and so much love in his eyes, my heart leaped with excitement and I felt like I was on top of the world. Also, the first time we were announced as husband and wife was unforgettable! It was so special and surreal; another moment I will never forget. 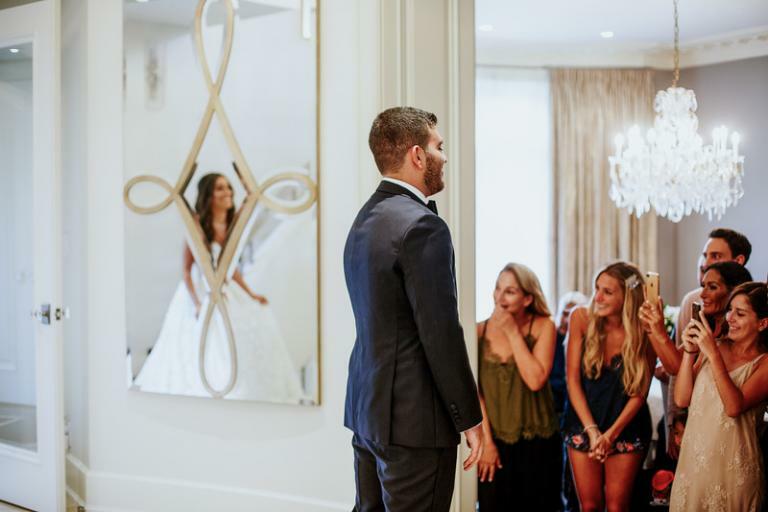 The Galia Lahav team was incredible to work with. They communicated with the ladies at White Montreal and every interaction was so positive. The team was always so accommodating and kind. They were meticulous about measurements and listened to the details that were important to me. The dress was perfect and it fit like a glove. 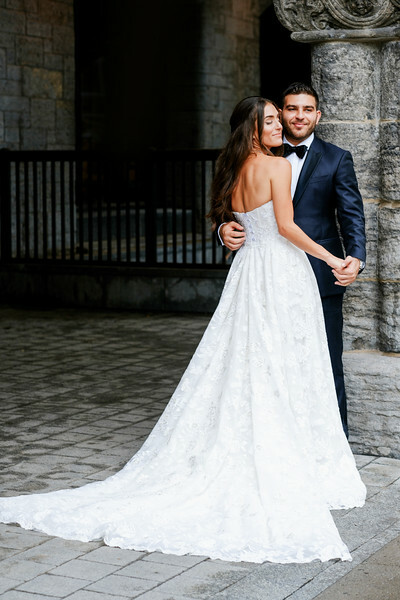 I purchased the dress from White Bridal Boutique in Montreal. The ladies at the salon were so incredible to work with; they were all so kind, attentive, and made the experience so enjoyable and unforgettable. 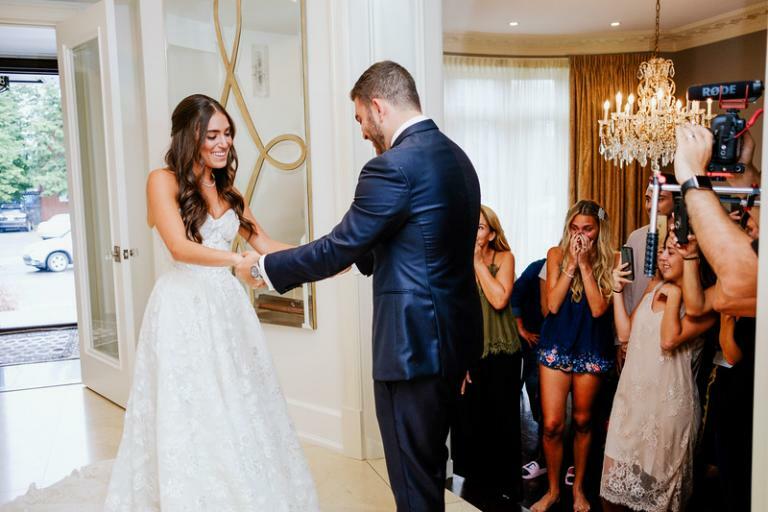 They worked really hard with the Galia Lahav team to tailor my dream dress perfectly. I’m so grateful to both teams for coming together to create such a perfect statement piece that made me feel beautiful, confident, and timeless. 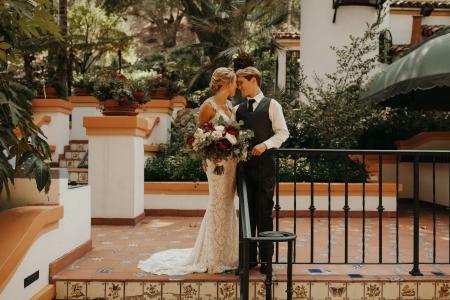 The whole planning process was so unforgettable because of every person involved; our families, our planner, our vendors, the ladies at the bridal store, and the GL team. Everyone was so kind, and incredible. They made every step of the way so enjoyable and exciting for us and they worked so hard to make our wedding beyond my wildest dreams. I will always be grateful for that. My advice would be to enjoy every step of the way. It may be overwhelming at times but don’t sweat the small stuff, keep yourself surrounded by loved ones and good and honest people, and everything will work out. Also, on your day, take a moment to look around, take it all in, and appreciate everything because it goes by like a dream. Our wedding day was better than anything I could have ever imagined; we were transported into a fairy tale. Everything was so magnificent and most of all we were surrounded by so much love. We couldn’t have asked for a better way to celebrate the start of our lives together.